We are beyond ready for fall (#basic, but it’s the best season of the year hannnnnds down), and have been finding some of the best pieces at Nordstrom lately. We’ve ordered way too much, but shopping online and trying on the clothes in our own homes is just so much easier than shopping with toddlers – talk about a horror story lol. I have to be honest, one of my favorite things about fall and winter is you can wear a beanie all day which means you don’t have to do your hair :). This one is so cute, only $25, and comes in 8 colors! Tie sleeves are big for fall, and this sweater is under $60 – such an easy, casual piece to throw on! I’m also loving this one and this one! I wanted a pair of cropped jeans for fall (to wear with booties) and these are perfect. Also easy to wear them with OTK boots like I did here – that way your jeans aren’t bunching up in the bottom of your boots…one of the worst feelings #amIright?! Love the side slit on the sweater – easy to tuck in the front and leave the back out. It’s still hot AF in Dallas but that isn’t stopping me from fall shopping (or shooting looks ha!). I was so excited when I got this Rebecca Minkoff sweater in the mail because it was even better than I expected – don’t you love when that happens?! I was on the fence about this fedora because of the price but honestly the quality and fit is so amazing. I have another Janessa Leone hat and wear it all the time so I think the price per wear evens out 😉 A couple options under $100 are here (LOVE! and Brixton hats are great quality), here, and here. 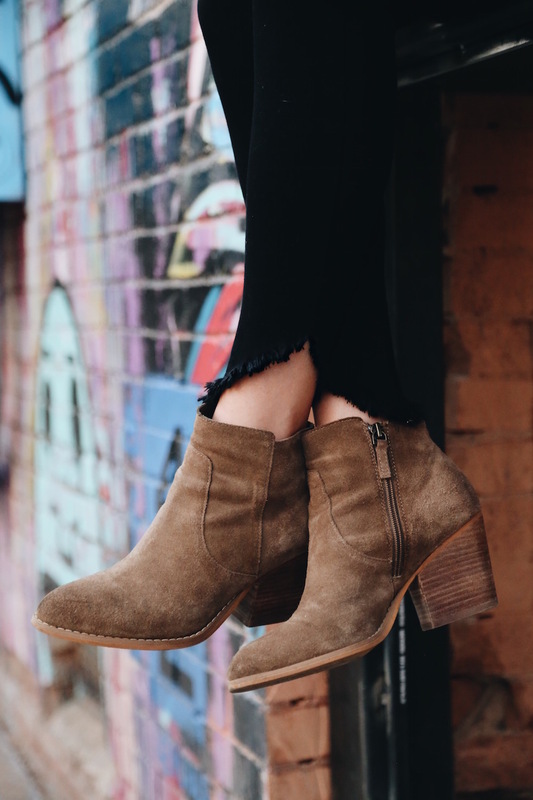 I actually bought these Treasure & Bond booties last year and they are still my go-to for everyday wear. They’re so comfy and can be paired with everything so I (obvi) had bought them in black too! I got these jeans during the anniversary sale but guess what! They’re on sale again! I love the diagonal hem and they are sooo soft and comfortable. They have a little stretch too which is what I need right now lol. Oh my goodness Meggan you are my hero for shooting that look here in Dallas! I am a totally hot weather lover but even I am getting sick of it and ready for Fall. (Last night on my walk home from work I opened the weather app and it said “Feels Like: 102 – I about died). Your look is 100% one I would copy and I wish you hadn’t posted that hat because now I think I need it gahhhh it’s so pretty! I want to buy everything in this post especially Meggan’s hat. It’s to hot here to wear any of these items, it’s 82 degrees, I’m still wearing shorts. Come on fall! We want fall weather too! Ughhh!! Cute-as always! What size did you get in the hinge tie sleeve sweater?